Extending the popular ergonomic design of the CK3 model, the CK3X mobile computer takes the best and makes it even better, giving you the power to put accuracy and productivity in the hands of your workers with a mobile solution that offers easy deployment and fast return on investment. The CK3X computer comes with a choice of integrated area imagers for standard range or near/far range scanning. The CK3X computer comes with a choice of integrated area imagers for standard range or near/far range scanning. These imagers provide unsurpassed scanning performance on 1D and 2D barcodes and are particularly well-suited for reading poor-quality or damaged codes. Support for omnidirectional scanning and very high motion tolerance enables workers to capture an accurate scan and quickly move to the next task. 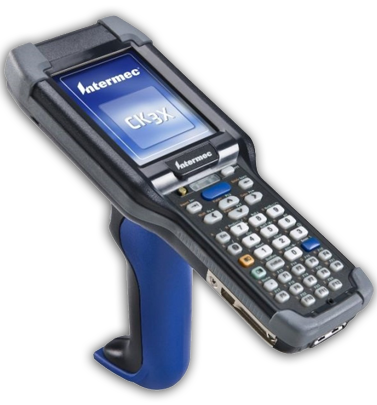 Featuring a highly adaptable design, the CK3X computer is supported by an 802.11 a/b/g/n and Bluetooth® wireless technology radio, as well as an optional RFID reader accessory. When outfitted with Honeywell Vocollect™ voice, you can combine the proven results of voice-directed workflows with traditional barcode data collection all in the same device.